The 330-foot-tall tower, completed in 1968, sits on a small, circular plot of land in the heart of the park and can be seen for miles in all directions. It replaced the earlier Arrows to Atoms tower that was constructed in 1957 and removed a decade later. 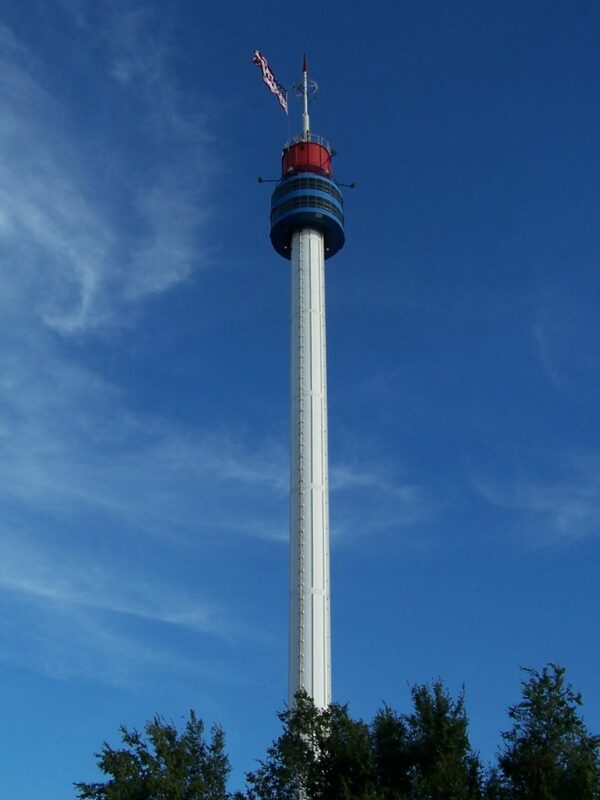 The Arrows to Atoms Space Tower, as the current structure was named, was modeled after the one at the 1968 Montreal Expo and included the finial from the original tower. To many, this is THE structure that identifies and defines the park. While the tower hasn’t been operational since a 2010 flood damaged the engine room, it is the last of the original mid-century modern elements of State Fair Park. When the Oklahoman broke the news in October 2018 that the tower was going to be demolished, the Okie Mod Squad started a petition to save it, which garnered over 1,500 signatures in just two days. Both the Oklahoma Historical Society and Preservation Oklahoma also provided letters of support to save the structure, but so far, it’s fate is still a sad one. UPDATE 11/9/2018: The Space Tower is being dismantled and just the original Arrows to Atoms finial that was part of the 1957 sculpture is being saved … at least for now.